I know I'm British & we don't have Thanksgiving....officially but you guys know how much I love American style food so I did a thanksgiving feast on Sunday & went a little mental with the food. This is something I came up with that I thought you guys would appreciate. 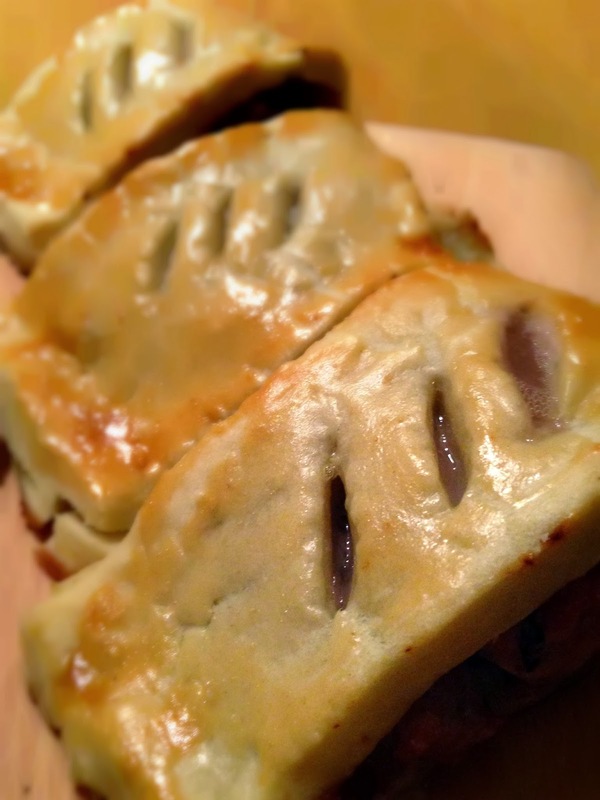 It is very simple to make & it is great for Thanksgiving, Christmas Parties & even New Year. Honestly you could make it anytime of year & it'd be fabulous. I also made these as meatballs (so no pastry at all) which makes them a great, low fat snack or holiday food. It'd be great for people who are wanting to do a healthy Christmas. They are also really, really easy to make. It's basically an assembly job; soak some dried cranberries in bourbon, add some flavourings to the turkey mince & then put the mixture inside shop bought pastry & bake. Yeah, bourbon. I'm loving this recipe. Obviously you can replace the bourbon with any liquid you want, 1tbsp shouldn't do anything other than taste good but I have had periods where even that little alcohol would make me really, really ill. I recommend lemon juice, orange juice or apple juice. Place the cranberries & the bourbon in a bowl & allow to soak for as long as possible (ideally over night but a couple of hours is ok). This plumps up the cranberries & makes them easier to eat. Combine the turkey, garlic, thyme, lemon zest & the cranberries plus any remaining liquid. I used a fork so that mince wasn't too compacted. Leave the mince to rest in the fridge for at least 30 minutes. Pre-heat the oven to gas mark 6/200C/400F. If you are making meatballs you can just scoop a ball of the turkey mince, place it on a baking sheet & cook for about 15-20minutes. 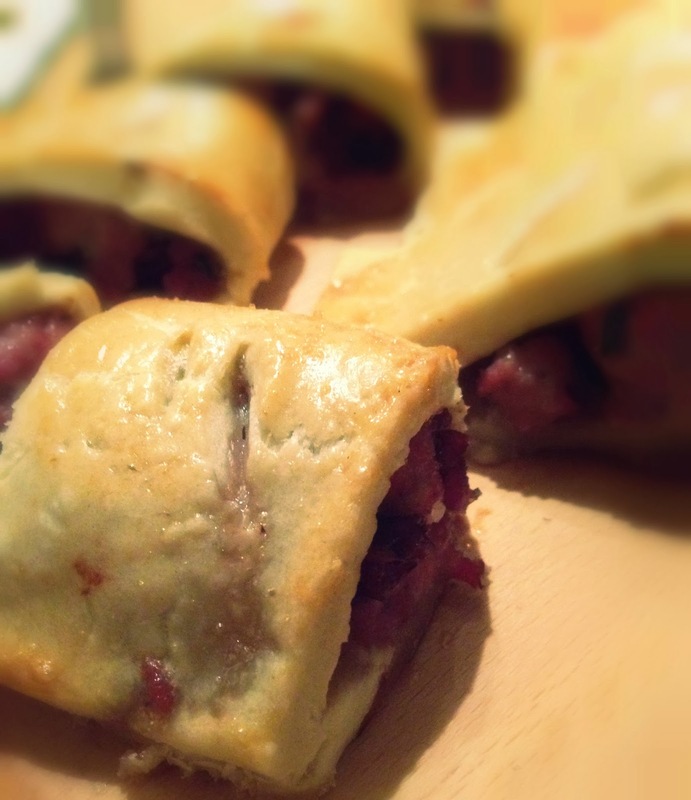 Cut the shortcrust pastry into strips just more than double the width you want the sausage rolls to be. On one half of the pastry (lengthways) place a line of the turkey mixture in an approximation of a sausage shape. 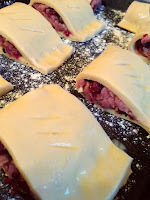 Fold over the pastry, crimp the edge (with a fork or with your fingers), cut into lengths & brush with the beaten egg. Transfer to a baking sheet lined with grease proof paper or dusted with flour & bake for 30-40 minutes or until golden brown & crisp. That's it guys. These are some of the best sausage rolls I have ever eaten & they really do scream festive cheer! I would love to hear how you customise them, maybe you'll soak the cranberries in something else, switch up the zest or fresh herbs, add toasted nuts or even change the kind of dried fruit? Please let me know by tweeting me a picture or posting a comment below.